Anuradha is a star related to success and can produce fame and recognition, especially through collaboration. Anuradha born can connect daily with the energy of their Nakshatra or Birthstar through their personal Nakshatra Incense. This incense is formulated with specific herbs mentioned in the Ancient Vedic texts and is sacred to their Birthstar. They would enjoy the experience of the unique, divine scent! Anuradha is a star related to success and can produce fame and recognition, especially through collaboration. People under this star have the persistence and ability to blossom in the midst of difficulty. Anuradha born can connect daily with the energy of their Nakshatra or Birthstar through their personal Nakshatra Incense. 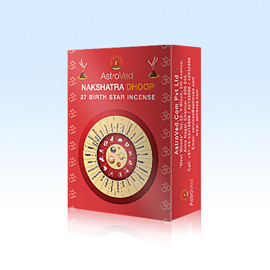 This incense is formulated with specific herbs mentioned in the Ancient Vedic texts and is sacred to their Birthstar. They would enjoy the experience of the unique, divine scent!